Couldn't sleep last night so just played around with the iPlayer logo and wanted to see how it looks in the BBC Sounds style. If BBC ever wanted their On Demand services to have a more unified look, rather than two separate services. Bit of fun really and by no means perfect, just thought I'd share. Glad you kept the pink. Nice consistency though. The Beeb could use more of it. I was thinking the same thing about the pink. I did experiment with purple/navy blue/grey but I think the pink is sort of recognisable now as iPlayer in a way. 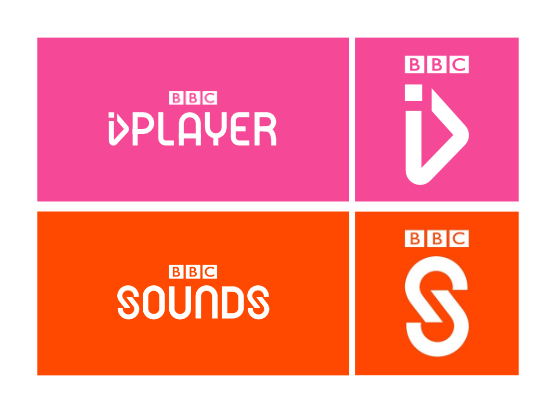 I like the idea but wonder if it might look better if Sounds was in the style of the current iPlayer branding, rather than the other way around. Yes, the execution of what you intended to do is superb. It’s just a shame the BBC Sounds logo is pretty poor to start with! Of course BBC Radio was in the iPlayer a few incarnations ago. I wouldn't be at all surprised to see a recombination sooner rather than later, especially if Sounds continues to garner a negative reaction despite it's well intentioned introduction. BBC Sounds is a mess. It's harder to find stuff. iPlayer Radio is much better.